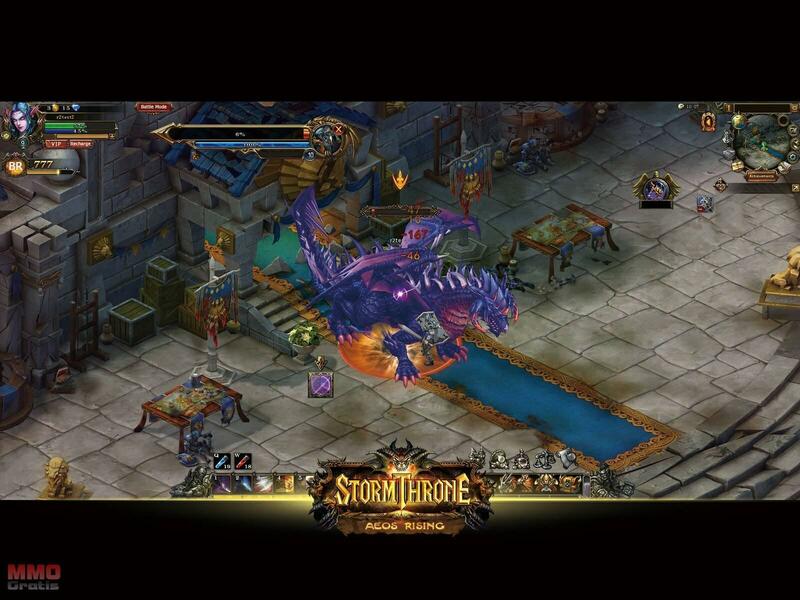 Stormthrone is a F2P Hero Building MMO RPG, borwser game developed by R2Games. Stormthrone is an action packed free to play fantasy-based MMO RPG where players are thrown into a world on the brink of destruction as evil and malign forces gather with the sole intention of eradicating all that is good from the realm. The game is a fully featured MMO with colourful stylised graphics that allows players to explore the world of Aeos with hundreds of quests and PVP and PVE content. The game is completely free to play and can be accessed through your favourite online browser with minimal registration. In a world created by the Trium, the three gods Beruva, Umbral and Tem, the lands of Aeos are under threat by the demon hordes that dwell beneath the surface under the command of the being known as the Voice Below; biding their time and waiting for the perfect time to strike in numbers. That time is now. The six available classes give players a variety of different options insofar as quests and combat, each class utilising their own unique brand of fighting with powers, abilities and skills unique to them in either ranged, melee or support style tactics. Those who embrace Tem’s legacy of innovation and change and gain mastery over the elements can study the arcane arts to become a powerful Mage, proficient with destructive long ranged attacks they are physically vulnerable, though few can get close enough before they have already fallen to the Mages devastating spells. Those that give themselves fully to the Trium in turn are blessed with the shielding of the Axiom and are the greatest bane to demonkind; their holy words and abilities sending the beasts of the dark fleeing back down to their pits of despair. Similarly the holy Paladin who on the Sun Goddess Beruva, and with sword, shield and holy light they are a paragon of hope in a world of darkness and are committed to their holy pledge to defend the weak and their companions. Warriors and Rogues focus on their kills being up close and personal, the Warrior harnessing the chaos of battle using their enormous two-handed weapons and brutality to bludgeon and destroy their enemies whereas the Rogue utilises more stealthy and restrained tactics, lurking in the shadows, identifying honourable points and striking swift and true at an enemies exposed weakness. The Hunter has embraced the wildness of the Storm God Tem, empowered with an insight into nature and the wilderness these fighters seek to restore the natural order and destroyed the corruption that Demons have brought forth using dangerous traps and a lack of mercy to ultimately defeat their enemy. It will take more than skill, willing and the blessing of the gods for heroes to fulfil their destiny, so too will they look towards gathering the Aeon Weapons, powerful artefacts created millennia ago that have fallen into the hands over the generations of some of the world’s most revered and feared heroes and villains. Whether the Wyrmbolt, the last remaining relic owed to the Wyrm Before the World, Xavidos, this powerful weapon was stolen by Dalg from Tem himself and used to wrought great destruction upon Dalg’s foes. So to did Khamurr the Half-Orc rise to notoriety, exiled by both dwarves and orcs in wielding the Sabre of Sundering in Beruva’s name Khamurr became a legend. Standing at the edge of the Driftworld, Derajj was the first God that fell to the powers of the Voice Below and now wielding Derajj’s Gavel and executing his own brand of judgement he awaits all who fall.